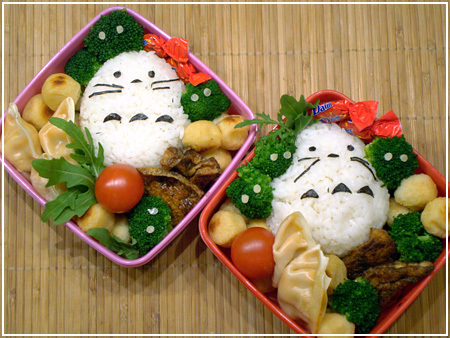 Totoro onigiri, croquette balls, broccoli soot spirits (stole that one from AnnaTheRed ^^;), dumplings, teriyaki tofu, cherry tomato, some rucola and Daim. 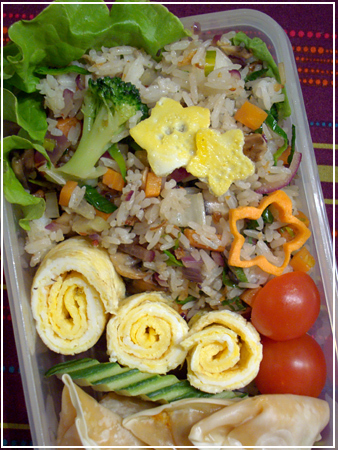 My bento for today – omuraisu (made with leftover restaurant rice), two frozen inarizushi, lettuce, cherry tomatos and carrot decoration. 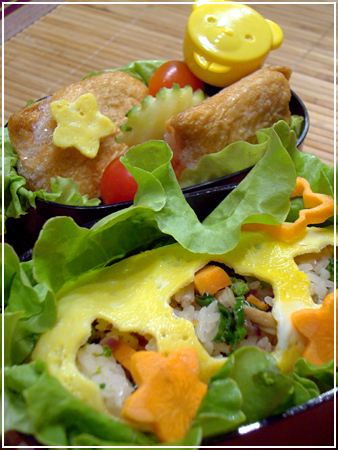 The BF gets the same, but his omelette is rolled up instead of wrapped around the rice. 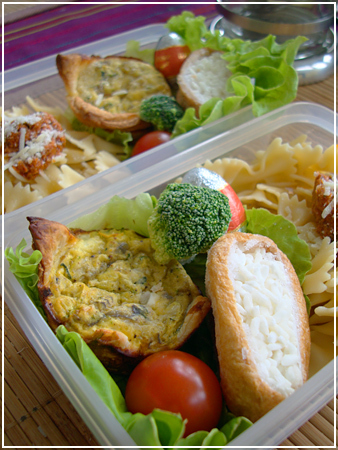 And these were the bentos I made yesterday with the last mini quiches from my freezer stash, leftover pasta with red pesto, frozen inarizushi and broccoli, and cherry tomatoes. The freezer stash saved me there – about time to make a new batch of quiches! 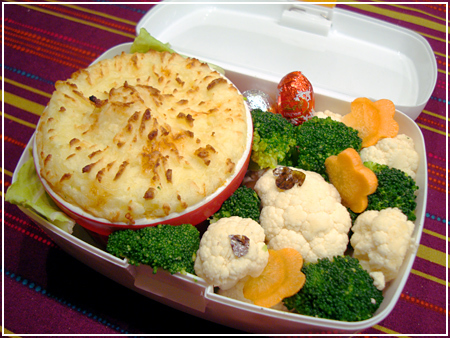 The cauliflower sheep playing between the broccoli bushes are glad, because the shepherd’s pie in the small ramekin is actually vegetarian. There’s also carrot flowers, and some chocolate easter eggs hidden under the bushes. Happy Easter to all you Werebunnies! Hope you had a great day, spring weather and lovely eggs to munch on. Makes 4 big ones (with egg) or 6 small-ish, bun-sized ones. 4 easter eggs for putting in the pinze, if you like. Put the flour into a big yeasting bowl. Warm the milk to room temp and add the yeast, then pour the mix on top of the flour (best to make a small depression into the flour, like a bowl). Sprinkle with some leftover flour and let yeast for about 15 minutes or until nice and frothy. In the meanwhile, prepare the rest of the ingredients. Warm the sugar, wine and butter and combine. Part the eggs (if you don’t know what to do with the leftover eggwhites, freeze them for later or – I just saw a video about a nice egg mask for your face…). When you’re done, add the yolks and the wine-butter-sugar mixture to your dough, and stir until a nice dough is formed and doesn’t stick to the bowl any more. Let it yease until the dough has doubled in volume. In the meanwhile, if you haven’t already, boil and dye your easter eggs. When the dough has doubled in volume, punch it down, cut into 4-6 pieces (I made 4, which are nice and big enough to stick eggs in them), roll the pieces into smooth balls and put on a baking tray lined with paper. Brush with the remaining yolk-and-egg mixture. Let rise for another 15-30 minutes. In the meanwhile, preheat the oven to 180 degrees Celsius. Brush again with the egg mixture. Using a clean pair of scissors, make three cuts into each ball. Brush one last time. 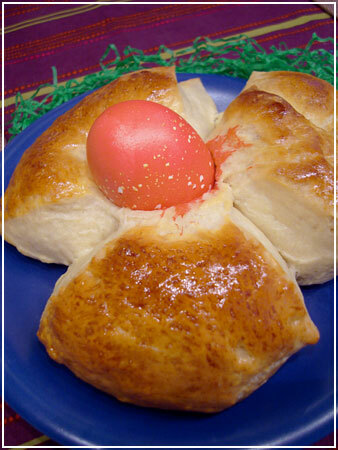 Make an X-shaped incision in the top and gently press the egg into it. Put it in the oven and bake until golden brown (I used 10-15 minutes with steam and another 10 without steam).